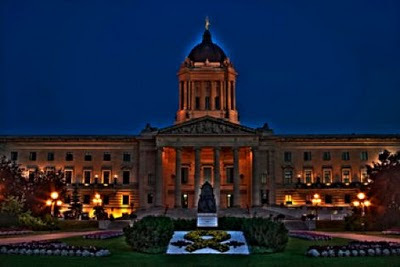 "The Mystery and Magic of the Manitoba Legislature." 2nd floor – 125 Adelaide St. I have had some feedback lately from clients that have been to another reader in the city (Winnipeg, but this goes on elsewhere) that I will not name. They report that after a reading that seemed fairly accurate the reader went on to tell them that the cause of their problems or difficulties is a curse, a curse that the reader could remove for them but it is strenuous (of course) and that it is a costly procedure - $700.00 to be exact. When the client told the reader they do not have that kind of money the reader said (ominously) "come back when you have it". I have heard of this before, it hasn't surfaced ( to me anyway) for a good many years. Back in the late 80's a local newspaper did an expose on this and the reader said "you can believe or not, I believe they have a curse". They were not shut down and their licence (at the time there was a city licence that required a background check, there isn't now) was not revoked. Back then the cost of curse removal was $500.00 and (get this) a pork roast - because the curse would get transferred into the pork, much like the biblical casting out of demons into pigs. This type of scam, (you can believe it's not a scam, I choose to believe it is) manifests in many forms. Sometimes they wait until they have read for the person more than once, building a degree of trust. I also have noticed that they seem to generally target certain ethnic groups, and always it is people that are carrying a degree of worry when they come in. They seem to be quite good at picking a mark. Whenever people come to me with this sort of issue I point out that it is not in my area of expertise. I do not deal in curses, spells or energetic issues outside of what is within the persons own ability to identify in their own patterns and work with themselves. I NEVER bring up a cost outside of the reading they have booked and I don't tell them they have to come back. In my practice (and that of others in my field that I respect) a reading is meant to work in compliment to the person's own judgment. A good reader does not try to make the client dependent on them. It's nice when people come back (I usually encourage waiting at least a season) and usually when I give a recommendation (counselling etc.) it is a referral to a resource that is free (see the area to the right titled "Useful Links" for some resources around the Internet and here in Winnipeg). I should mention too that there are resources to energetic work that can be helpful, such as practitioners of Reiki, alternative healing and various forms of work. Part of learning to work with intuitive awareness is about identifying what is baggage we are carrying and also how to have a healthy defense system in dealing with energy that is unhealthy for us. Like any profession there are those with abilities that are worthy of their hire and you can shop around, check their reputations and in most cases,if these people are working conscientiously they will be above board in what they do. If you ask around there are a good many people in various fields that can be helpful. many of the local resources that I respect in energetic work (energetic clearing) are responsible practitioners, they will offer suggestions in a way that is self empowering and not about creating dependency. They usually will tell you that this (energetic work) IS in their area of experience, you know this is what you are going for when you go in - fair enough. These people charge reasonably and to each their own. At the same time there are things to watch out for - ANY time a person brings this sort of thing up in an intimidating or threatening way and tells you not to breathe a word of it to anyone that's a huge red flag. Also if you have a belief system, faith or religion that follows this sort of belief, there are usually people whose job it is to take care of this for you (elders, priests, ministers etc.) and they often are operating either on a not for profit basis where perhaps a token offering is made or their services are offered for a reasonable rate that should not have surprise costs. My advice is always to take what a reader says (myself included) with a grain of salt. Your life, health, well being (physically, emotionally and spiritually) are ultimately your own responsibility. Anytime a reader makes you uncomfortable, scares you or encourages dependency on them as the only solution to your problems, walk away. Also, if you don't want to be responsible for yourself, instead choosing to believe that all your life's ills are caused by fate or curses, then I am definitely NOT the reader for you. By all mean go to the sort of person that supports that. I should mention though that you might need a second job, in the cases I have heard of the 700 will not be enough, part of the scam is that once they know they've got you they can say the curse was heavier than they thought, (apparently like lice, more than one treatment may be necessary) and subsequent treatments go up considerably in price. We certainly seem to be moving through a time of great change. Some would say when are we not? There's so much going on in the world that has our usual patterns going haywire, from weather and other environmental concerns, to economic shifts that have had everyone feeling apprehensive. My area of intuitive work is more on a "one on one" basis in working with people's life energies. I see a lot of issues working through in vastly different ways. Many who are approaching retirement for instance, are looking at a different set of potentials than they had envisioned just as little as three or four years ago. The impact works through, directly and indirectly on a number of levels. People aren't as quick to get divorced in some situations as the necessities of staying together are different. Issues around how we care for our elderly and our children and communities are more at the forefront. I'll leave the astrological predictions of the time to people much more qualified on those levels. It is interesting that the later part of this month does have some big transits going on, Saturn into Libra, Mars, Uranus all moving into different signs. There's some big alignments taking place, but again, some would say when isn't there? Many of these things point to the later part of this month through October as a time of some very big bumps and shifts. Most of the resources I find useful though also stress that we have to grow through this, not just go through it. On a personal level, I've had to, like so many, look at priorities and security in the last few years. When I made the decision to have my business and much of my life settled in Winnipeg's North End, some people found that odd. It is an area that does have poverty and struggle, but it also has endurance, character, some very good people who care about community and a sense of loyalty in the support of neighbors. I don't think we would be still operating had we gone with a more expensive or "trendy" location. Our area is often in the news, but I can also say that I have a sense of safety here. I get panhandled less in the north end than I do downtown. A friend asked me recently how is business, my running joke is some days it's Kraft Dinner and some days No-Name Mac and Cheese. I have had to make some transformational, not just circumstantial changes in my life. 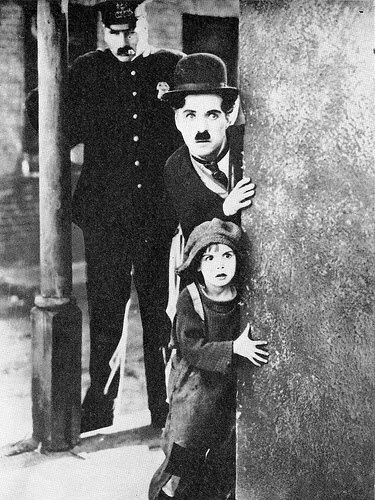 The picture (above left) is from Charlie Chaplin's silent film "The kid" with Jackie Coogan (who went on to play Uncle Fester in the Addams Family TV show- how's that for trivia). The film was made in the time of the great depression. It was in that time that the home I live in was built. 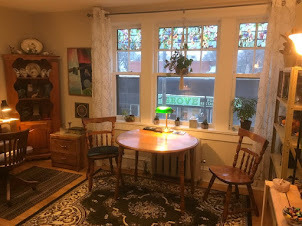 It's a place that has what they now call a "granny flat", in other words it's an old duplex, but with the ability to convert easily into a single dwelling. Back in the time it was built a lot of families lived - by necessity- cooperatively. I've been blessed to have, in addition to my biological family, an extended family that tries to live that way. I've been part of adult kids moving back home (building bunk beds requires a DEFINITE sense of humor). What some would have seen as inconvenience has always turned out to be something incredibly important, a privilege to be part of and there's a lot through it all that has helped me grow. As a reader, I find I am picking up more and more, not just on the circumstantial changes people are moving through, but more importantly the transformational changes we have to come to terms with. Things aren't going to get back to "normal" folks. This is normal, this is it. We have had a 60 to 70 year detour, time to get back to what has helped us survive. That's just my opinion. I said in an interview about two years ago that we need to look at the experience of people in the earlier part of the last century, take back the wisdom we have stuck in nursing homes and disowned. Listen to our elders and be prepared to share that experience. Sorry if this seems heavy, but at the same time, I am not the sort to just placate where we sometimes need to wake up. It is a heavy time, but it is also a time of great positivity. Transformational change is where we find tools and muscles we haven't used before. I believe the Creator gave us these things when we set out on our journeys, but it isn't until we get to these inconveniences sometimes that they really wake up. True there are some that actually go looking for transformational change, but real awakening isn't just a weekend retreat at Mount Shasta (don't get me wrong a weekend retreat can be a great thing and for some very helpful, but real transformation is not something we can usually schedule). We are moving into the real acid test of a lot of the new age learning and discovery that came in during the 60's. We have a generation approaching retirement that could be the greatest benefactors of mentorship in the history of the world. We might not get to loll for half the year on a pristine beach, we might have to go for a holiday then come home and work part time in our communities, but low and behold we MIGHT just be better off and richer in other ways than we would be otherwise. So that being said, (I know, I have to stop saying "that being said"), I think we are in for a LOT of positive change. Fasten your seat belts! I always come back to the Desiderata, the part about "look after your career, it is a real possession" is not just about looking after your job, it's about doing what you do in a way that expresses who you are, and especially; "whether or not it is clear to you, no doubt the universe is unfolding as it should".